The Friends of the James Theatre Inc will present a varied program of films including recent release movies, school holiday programs, ‘arthouse’ films on the 3rd Sunday of the month, our classic film series Down Memory Lane, and small film festivals like Agog – a feast of foreign films, and Flickerfest. 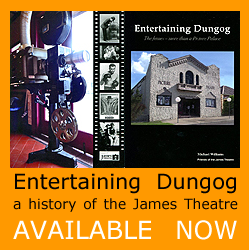 Tickets prices for recent release movies, and single ticket Dungog Film Society and Down Memory Lane movies, are $13 for adults, $10 for children and $40 for a family ticket (2 adults and 2 children/or 1 adult and 3 children). You can also buy a 10 ticket multipass for just $110, which gives you entry to all our regular films in 2017. Details of our program will appear on this site. To save you checking the site regularly, why not subscribe to our regular newsletter? Just hit Contact Us and ask to be put on the mailing list. AGOG! Feast of Foreign Films is presented and organised by the Friends of the James Theatre. The aim is to bring to the local community and further afield as many quality foreign or short films as we can. Details of the program for 2016 will be advised as soon as available.